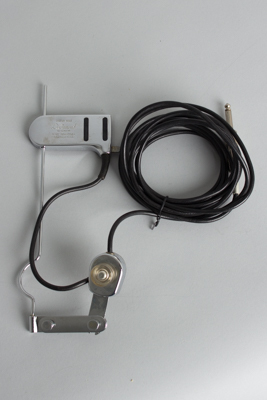 DeArmond Model FHC Model Archtop Guitar Pickup (1950's), made in Toledo, Ohio, chrome finish. This is the classic early 1950's version of this most popular of all add-on archtop pickups, with the hard-wired cord and clear "hatbox" knob. It is in excellent working condition, all original with only very light plating wear and sounds fantastic. Excellent - Condition.